A Christmas List is something we all make. Whether it be in our heads, in the back of a notebook, in a blog post for everyone to see... ("ehem.") And it is always going to be a list of beautiful things that you've collected and compiled over the year to create a pretty list of all the things you want and love in one place. The boyfriend said once that Christmas and Birthday presents are always things you want but would never buy for yourself, and in a way I believe him! I would never go out and just buy any of the things on my list unless I had super-spare cash burning a hole in my pocket... Which is never. River Island Mongolian Fur Tote - This is all Lily Melrose's fault! After she showed off her beautiful new bag on her YouTube channel I fell in love with it and I cannot find a bag that can compare to how beautiful this one is. It must be so soft... Topshop Fur Collar Biker - I don't need another coat, but it somehow makes sense to buy a new one every year. I love this one from Topshop and stare at it every time I walk past it at work... Maybe I will get it after Christmas if it dips into the sale, but it's still on my list for Christmas! YSL Rouge Volupté Shine - A designer lipstick has always been something I've wanted. And I've heard nice things about these YSL ones. I'd love it in a bright pink, or a beautiful coral colour. Bunny Lamp - How adorable! This would easily replace my current lamp. Anything to make a room a little cosier, and a little cuter all at the same time! Jackelope Cotton Wool Holder - I spotted this on the UO website a few weeks back and couldn't stop laughing at the cute dispensing system. Since then, I decided that this would make make up and nail polish removal so much fun. Marc Jacobs Henry 36.5mm - I've always wanted a decent watch and this pretty simple number from Marc Jacobs fits the bill to match up with all my other silver and white gold jewellery. I also love the bright pink detailing and polka dots! Very me! Ted Baker Lidia Purse - Who's not ever wanted one of these!? I would have loved one with the doggie clip but they don't make them any more, my second favourite was always this pink and purple one. I love that there's always little frenchie dog prints on the inside of all the purses. Cute no? Moschino Augustino for iPhone 5 - In January I will be upgrading to the iPhone 5S and I have started my search for the best iPhone case that will take over my new phone and stay on it forever. Which ventured me into the likes of designer cases by Moschino! I've seen Milkteef's and a few other blogger's cases by the brand and loved them all. Moschino only a few days ago released Augustino the Panda and Violetta the Bunny and I'm loving Augustino so much! Someone get me this pleeeaaase? Gift Cards - Who doesn't love a gift card. Money you HAVE to spend on fashion... Yes please! Marc Jacobs Honey - Everyone everyone everyone raves about this and I want to try the hype!The description on the Boots website says the fragrance is sunny and energetic. I have yet to smell it but if it's as good as everyone says I'm bound to love it. Enrapture Totem Styler - My lovely lovely boyfriend bought me GHDs last year for my birthday and I was shocked and super excited to use them, and they have been probably my most used gift ever! Unfortunately my hair doesn't curl with the GHDs, and just fall straight again (even though my hair is curly anyway!?) so a pair of curlers to do the job would be lovely! A swap between two styles is always fun, and I've heard these curlers are probably one of the best around right now? PUPPY! - I am obsessed with little puppies at the moment and send pictures to John alllll the time of puppies, dogs and all sorts. I can't hep but really want one of these wrinkly fellas! They're cute big and small, and everyone who knows me knows that that puppy would never be just for Christmas! I would cuddle that thing for everrrrr. Jeffrey Campbell Lita Daisy - These boots are just beautiful! I love the print and they would look great with everything! It's so girly as well which I love, and I've been looking for something girly like this for a while now. Seems everyone's doing masculine boots these days. 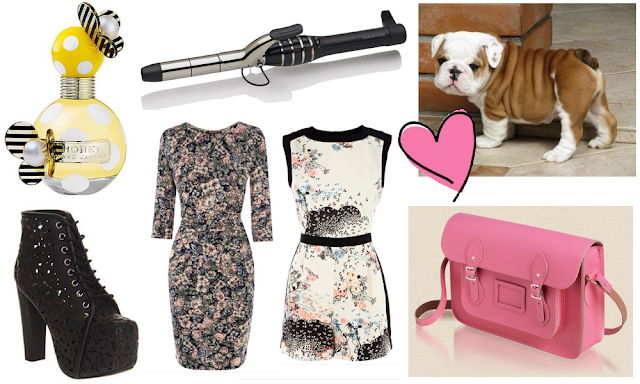 I prefer girly, so it's Daisy print for me! Warehouse Tapestry Floral Dress - Warehouse make the most perfect dresses, and I can't seem to find dresses that I'm absolutely loving from any other brand. I have this dress in a different print, but you could always have more in different ones can't you? Warehouse Oriental Playsuit - I didn't even know Warehouse did playsuits, and after seeing this on the website I was in love! I saw this print in one of their shirts in store, and I loved it. To see it on a smart playsuit makes me love it more. I just wish they weren't so expensive... Cambridge Satchel Classic 14" Pink - I always said when I find my dream job where I need a special work bag I would get one of these. I'm not too sure when that time will come, but I'm becoming impatient. I'm sure my time will come, but I just truly adore these satchels, and a pastel pink like this would be just lovely! My Christmas list seems a little... a lot long. But with all the festive excitement I was endlessly dream shopping online and found too many pretty things. Shops have to stop making such amazing things for poor ones like me to see, and then want lots. I'm really trying to not shop for myself at all until after Christmas, as it's Christmas presents shopping time from now until the big day... I think I know what I'm getting everyone and I've just bought my first gift too! I should be going shopping in a couple of weeks with the boyfriend on our week off, can't wait all the presents sorted, so I can forget the stress of it all in December! Have you started shopping for Christmas gifts yet? Leave your wishlists below if you've made one up already too! Omg that puppy! So adorable! I love the pink satchel too it's so cute!